The five pillars of Atlanta Track Club’s winning Olympic Team Trials bid. The power of storytelling and connecting with your audience — always critical to writers — took on Olympic-sized significance during last week’s APMP Southern Proposal Accents Conference in Atlanta after the conference’s memorable and inspiring keynote presentation by Rich Kenah. Rich, executive director of the Atlanta Track Club, shared with proposal managers throughout the Southeast how his not-for-profit running club won the bid for the City of Atlanta to host the U.S. Olympic Team Trials – Marathon next February, beating out Orlando, Chattanooga and Austin for the prestigious award. For readers not familiar with Atlanta Track Club, it happens to be the second-largest running organization in the U.S. This year the Club will celebrate its 50th year organizing Atlanta’s annual AJC Peachtree Road Race — a 4th of July tradition and the world’s largest 10K race that attracts 60,000 runners. Next Feb. 29th, 500 of America’s top runners will converge on Atlanta to compete for six positions on the U.S. Olympic team before a live televised global audience. The City of Atlanta anticipates 100,000 spectators will watch the marathon live, with the total economic impact for Atlanta estimated at $30 million. “What made us the winning bid? We reviewed the challenge, asked ourselves the hard questions and understood the course and the race,” said Rich, a former Olympic runner who brought together a team of volunteers and leaders in the city to formulate a compelling bid that ultimately won over the U.S. Olympic Committee. Those constituents included the State of Georgia, NBC, Resurgens and key athletic organizations: the International Association of Athletics Federations, the international governing body for the sport of athletics, and USA Track & Field, the U.S. national governing body for the sports of track and field, cross country running, road running and racewalking. Another challenge was the fact that Atlanta has no 100% flat running course unlike other bid cities — something known to the athletes. 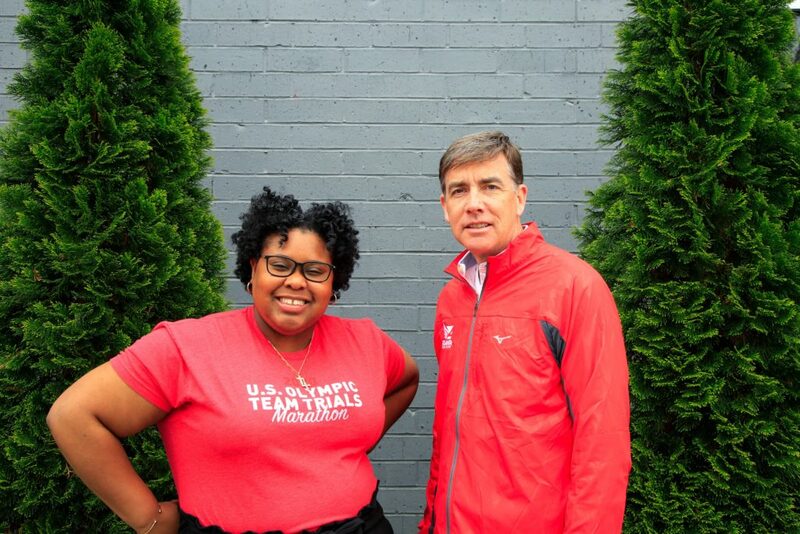 Assembling a winning Olympic bid: Shana Smith and Rich Kenah from Atlanta Track Club. Rich looked to the talents of his Club’s 30-person staff, who had never submitted a bid before. He appointed a “coach” to own the submission, pull together pieces of the 88-page bid response over a two-month period and keep everyone on track and on deadline: Shana Smith, who has a Master’s of Science in Sports Administration and serves as the Club’s registration manager. Atlanta Track Club staffers developed five bid pillars fashioned after the five Olympic rings that articulated why Atlanta should be the chosen host city, built around the theme – Olympic Legacy, Olympic Future. “Atlanta Track Club will reignite the city’s Olympic fever and recognize Atlanta’s Olympic Legacy while celebrating America’s top female and male distance runners as we build an Olympic Future,” the Club’s bid Executive Summary states. Another pillar was Atlanta’s Olympic legacy and Olympic future: Rich explained that Atlanta had the advantage of being a former Olympic city, with much of the infrastructure built to support the 1996 Olympic Games still widely used by the community today (think Centennial Olympic Park and the dorms on Georgia Tech’s campus). With Atlanta as host city, several TV stories could be shown set in these Olympic venues. Another pillar promoted Atlanta’s walkability – how the city’s MARTA transit train system would ferry athletes from the airport to their hotel and racing venue without ever having to get into a vehicle and deal with the city’s congested roadways. Above all, the bid proposed a sustainable model that “recognizes the value that each constituent group brings to this Championship in a city that has a vibrant Olympic and running history.” The five pillars captured the imaginations of both the evaluators and the athletes. For one, it proposed a first-of-its kind revenue share relationship between a local organizing committee, USA Track & Field, and most importantly, the world’s best and most respected endurance athletes. This concept was particularly significant to Rich, who recalled during his own Olympic journey how elite athletes received deferential treatment compared to qualifiers who lacked sponsorship but were still vying for a place on the U.S. Olympic team. Meb Keflezighi and fellow runners pose for a photo after completing the AJC Peachtree Road Race on July 4, 2014 in Atlanta. Atlanta’s bid wouldn’t be complete without a dynamic video message from Meb Keflezighi. The silver Olympic marathon medalist narrates the host city bid video, sharing why he’s a major fan of Atlanta and the city’s running culture. “Atlanta is where runners can chase their dreams and their goals,” stated Meb, recalling his first glimpse of Atlanta as a UCLA student watching the 1996 Games in Atlanta; in 2004 he won Olympic silver in the marathon and finished in fourth place in the 2012 Summer Olympics. Instead of accepting the RFP requirement that the host city pay $100,000 to the Olympics’ national governing body, Atlanta’s bid team countered with a novel concept: committing $75,000 for youth fitness programs here at home — to get area young people moving. Rich notes that such an investment may result in lost revenues in the short-run, but it’s the long play that he and other city leaders are most focused on. “We are looking to inspire Atlanta,” says Rich, noting that the fifth bid pillar — for Atlanta to become known as “Running City USA” — will hopefully inspire every day Atlantans, from soccer moms to teens and retirees — to embrace a healthier lifestyle. This entry was posted in Uncategorized and tagged APMP, Atlanta, Atlanta Track Club, Marathon, Olympic Team Trials Host City, Proposal, Proposal strategy, Rich Kenah, Running City USA, U.S. Olympic Team Trials on March 28, 2019 by AnneWainscott. "I learned never to empty the well of my writing, but always to stop when there was still something there in the deep part of the well, and let it refill at night from the springs that fed it."